The Precision is my Inspiration microsite launched in April in conjunction with the new brand film of the same name was just awarded its 7th prize. The site is featured today as FWA Site of the Day by the prestigious and industry-recognised Internet award program established in 2000. “Swiss excellence can also be achieved through the design of our communication tools and demonstrates our constant quest for perfection in all areas; in the creation of new exceptional timepieces and in the design and development of a website dedicated to the showcasing of our brand values. 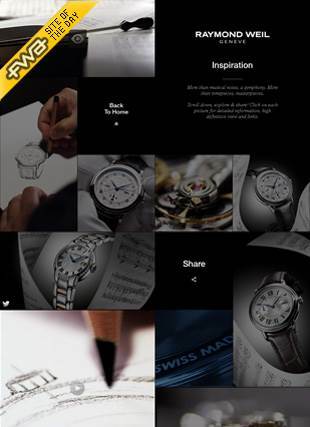 We know FWA and CSS, to name but a few, are key achievements in the digital landscape so we are very proud of these accomplishments.“ declared Elie Bernheim, Director at RAYMOND WEIL. Built as a frame for the new brand film, the microsite also offers exclusive interviews, behind the scenes content and downloadable goodies such as branded desktop wallpapers and cover pictures. Its neat music-inspired design confirms the Brand’s deep attachment to music and illustrates its expertise and know-how.